Plot Summary: A series of murders in which the victims are burned to death is tied to a mysterious Tenctonese box that keeps transferring from person to person. George is shocked to learn that one of the people involved in the killing is Uncle Moodri, who is a member of the Edlers, the Newcomers chosen to keep the old ways alive in the minds of future generations. The search for the box intensifies, with Sikes and George finally coming to understand it's importance to the memory of the Tenctons' home plant. Plot Summary: Susan and Buck decide to become heavily involved in politics, as an amendment to the constitution which guarantees equal rights for Newcomers is soon to be voted on throughout the land. A series of attacks is launched on campaign headquarters and important Newcomers are involved in the ongoing struggle, resulting in a growing sympathy for the Tenctonese. Everyone blames the Purists, but Sikes and George aren't so easily convinced. In the meantime, Sikes, who has been drafted as the leader of his building's tenant association, learns of the necessity of the democratic system, even on such a basic level. 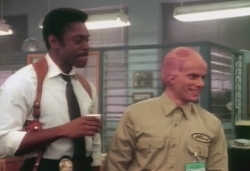 Plot Summary: George and Sikes investigate a series of murders, but are removed from the case when the FBI becomes involved and claims jurisdiction. 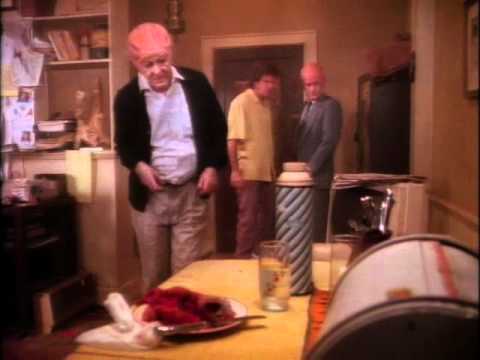 "Project Dart" is discussed and the words have a powerful impact on George, who is haunted by the dim recollections of something horrible. 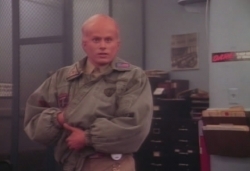 Through hypnosis, he reveals that while in quarantine after the Newcomers landed on Earth, he and a group of fellow Tenctonese were brainwashed by the United States government to be made into perfect killing machines. The "programming" didn't work on George, who had an ethical imprint they couldn't not penetrate, but one of those machines has decided now to fight back against the people pulling the strings, exterminating them one by one. Plot Summary: Newcomer Clara Bow is thought to be a Black Widow Killer, mating with and then murdering sexual partners she meets through a computer dating service. These crimes are revealed to be the work of Ted Healy, a former obsessed lover of hers who can't stand the thought of her being with anyone else. As such, he's lined up his next target, George Francisco, currently involved in a sting operation. The on again, off again Sikes-Cathy relationship veers off course a bit when he tries to get her to watch some Three Stooges comedy films, and she, like most human females doesn't think they are amusing at all. Complicating his life even further is Tectonese Marvin Gardens, who has taken a bonding drug and fallen in love with him, the same bonding drug that an insecure George wants Susan to ingest. 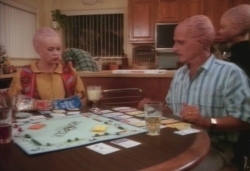 Plot Summary: During the Day of Decent, George is confronted with his past as a slave on the spaceship, when it appears that an old Russian Roulette style game he was once forced to play has returned. Will George take revenge for his brother, who died being hit by a bolt of salt water while playing the game on the ship. Plot Summary: Since George and Susan have agreed to have another child, they ask precinct janitor Albert Einstein to serve as their "Binnaum". It turns out that it takes two Tencontonese males to impregnate a female: the first make, in this case George, provides the seed, while the Binnaum become the catalyst which allows the conception to occur. Sikes, naturally, has a variety of salacious reactions to the concept, but George chooses to ignore him. It's soon becomes known that Albert was part of the Binnaum religious sect on the ship, but abandoned it to live as a regular Tenctonese. That order's leader looks upon his serving as catalyst while outside the order as sacrilege, and, as such, he sets about making sure that Albert does not perform this function, even if it means killing him, as this leader has done with the others of his kind before. Sikes and Cathy move a bit closer to true union, as Sikes questions George about Newcomer erogenous zones and the things that arouse them. Plot Summary: George and Susan decide to have another child. However, when a leading scientist is murdered Sikes and Francisco uncover a plot by the Purists and an Overseer to contact a probe that has come looking for the lost Newcomer ship, threatening both the Tenctonese and the Humans. At the same time Matt and Cathy get to know each other better as they share details of their past. Plot Summary: Sikes and George are assigned to investigate a series of murders in which the victims were drugged into submission and their hands hacked off above the wrists, resulting in their bleeding to death. The duo find their suspect, an elderly newcomer whose target is the Overseers, and his purpose is to seek retribution for the atrocities performed on the slaves. George, while having been sworn to uphold the law, finds himself in the difficult position of agreeing with the man philosophically. Sikes decided to let George call the shots on this one. Plot Summary: Struggling to pay a debt of $2,400 to the IRS, George finds himself having to go to a successful Newcomer businesswoman Betsy Ross for a loan. Ross, who claims to be impressed with the progress that George, one of their own, has made on this planet, is happy to help, and, in addition, insists she can get for him information about dealers of the hightly addictive narcotic "Jack", termed "the crack of the 90's" Sikes doesn't trust Ross, but George refuses to accept his argument until it becomes clear that Ross is actually an Oversser trying to corner the Jack market for herself. Plot Summary: Due to a series of riots throughout Los Angeles, George and Sikes are the only ones left in the precinct to answer calls, dispatch cops, and so forth. As Susan visits the precinct, bringing George his lunch and retrieving his dirty uniform to be cleaned, a truck pulls up outside with a group of people, who are planning to rob the evidence locker within the now near0empy precinct. Plot Summary: Sikes' daughter visits, accompanied by her radical boyfriend, and Buck Francisco faces expulsion from school. Plot Summary: Sikes and George uncover a prostitution ring after a Newcomer prostitute, on the run from her pimp, is murdered in Sikes' apartment. Buck deals with his past with the help of Uncle Moodri. Plot Summary: Sikes and Francisco investigate a doctor who is killing Newcomers to benefit human patients. 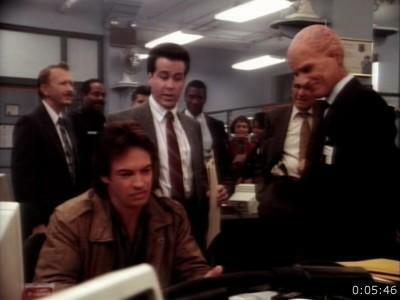 Plot Summary: George and Matt are partnered together and are assigned to investigate their first case together; a vagrant has died and has strange sores on his body. Matt receives a large box of information on the newcomers and slavery from his deceased partner, Tuggles. This information gets Matt and George looking in some strange places and re-evaluating Tuggles death. George and his family move into their new home and face the challenges of moving into an upscale neighborhood. Matt meets his new neighbor and they begin a difficult friendship. 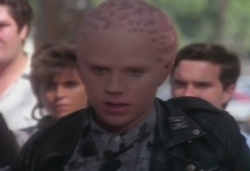 I've been a huge fan of Alien Nation since the movie came out back in 1988. Then when I heard they were making a TV series I was so excited. 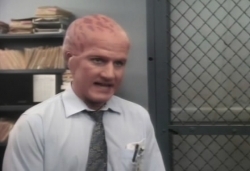 Debating during the 1989 - 90 TV season Alien Nation was met with praise and good ratings but unfortunately Fox was going through some finance troubles and axed all it's hour long dramas including Alien Nation. 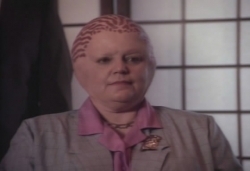 To the Alien Nation producers this was very unexpected as the ended season 1 on a cliffhanger expecting to get a season 2. The show built a strong fan base, and popular demand led to "Dark Horizon", the episode that would have begun the second season, being novelized and adapted as a comic book as well as spawning a series of novels. 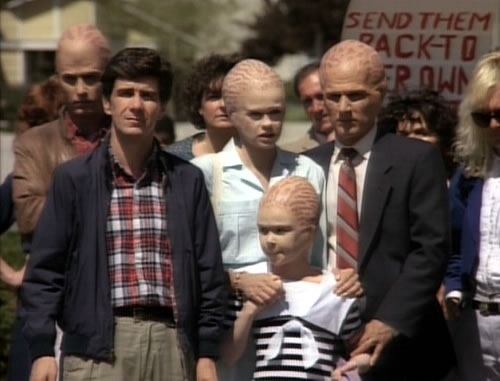 Four years later, after a change of management at Fox, the story of Alien Nation continued with five television movies (including all the original cast), picking up with the cliffhanger. With this podcast we will review each episode starting at the beginning. Will give you our thoughts on the episode and as much behind the scenes info we can find. Will also be reviewing the movie, novels and comic books.